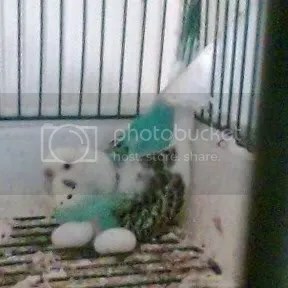 ← My parakeet is trying to hatch some white jellybeans! A picture of Gumby hatching her jellybeans. I just took a picture of Gumby with my new cell phone. It’s not the clearest picture in the world, but you might be able to see how content she looks. She’s not exactly sure what she’s supposed to do. She is sitting next to the jellybeans instead of on them, but her God-given motherly instinct is being taken care of. Birds only sit on the ground when they are sitting on eggs, so I know she is happy. Like I said yesterday, her mate is her brother, so we can’t let her keep her eggs. But, the more we take away, the more she lays. Now that we put in the jellybeans she is happy. The picture to the left is Beady. (taken with our digital camera that needs a new battery). 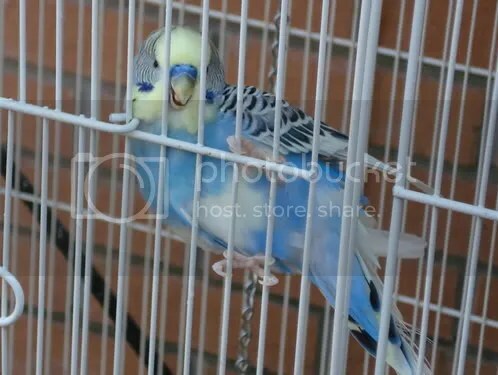 He is the cutest parakeet in the world, and Gumby’s brother and mate. He has outlived two other mates, poor Beady, but he hasn’t given up on love.